Star Company remains one of the more controversial former basketball product lines based on a limited print run, non-traditional pack-out, limited distribution, and overall questionable card quality, in addition to counterfeit and unauthorized reprint rumors. However, Star Co. cards, notably 1984-85 Star Company, remain very popular with collectors and authentic versions command strong values. Although Star Company released their first set in 1983-84, the 1984-85 Star Company release is particularly noteworthy because several Hall of Fame players made their NBA cardboard debut in the set. This includes the first NBA licensed cards for Michael Jordan, Hakeem Olajuwon, Charles Barkley and John Stockton, among others. The second major release from Star, 1984-85 Star Company Basketball came at an advantageous time for both basketball collectors and Star Co. themselves. Since Topps left the basketball market after 1981-82 Topps, and another major card producer would not emerge until 1986-87 Fleer, Star had the only NBA-licensed cards available between 1982 and 1986. 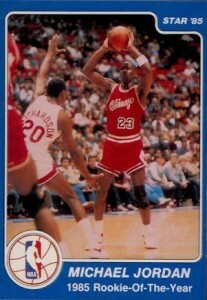 The 1984-85 Star Co. set was comprised of 288 base cards, broken down into team groupings and a few insert subsets. Instead of being sold as a full set or as a more-traditional product where packs and boxes contained random cards, Star issued their cards as team sets, in sealed plastic polybags. Each team set varied on the total number depending on the team, but most team bags featured ten to 14 cards. Although the exact print runs for each release were never disclosed, Star Company was limited throughout its official production period and it is believed that less than 8,000 total sets were produced in 1984-85, with some estimates putting the total as low as 3,000 of each team set. On top of that, the primary distribution was limited to just a handful of outlets and some regions were largely omitted. The 1984-85 Star Company design is very simple with an action image, single-color border, circle team logo in the corner and white text. The cards suffer from cutting and centering issues, and cards that were in the front of the team bags are subject to additional wear. The single-color borders also had problems with chipping. This has resulted in a considerable premium for the rare Mint and Gem Mint card versions. Adding to the problems, it came to light that Star Company had printed unauthorized cards using the original plates. 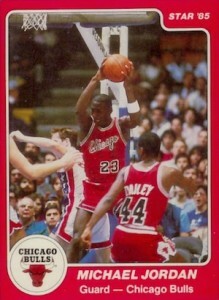 Although it was allegedly only the second half of the 1985-86 set, the seeds of doubt began to grow. This, along with counterfeits, puts collectors in an unfortunate situation when making purchases and is further complicated because PSA and SGC will not authenticate or grade Star Company cards. Starting near the end of 2008, BGS began to grade most Star Company cards, and currently remains the only major grading service to do so. PSA previously graded Star Company cards, but has not done so for many years. While it is recommended to only buy authenticated Star Company cards, especially when dealing with the Michael Jordan cards, there are a few things that can help distinguish the authentic cards from reprints and counterfeits. The first thing to inspect is the border. Reprints and counterfeits will feature the wrong color border or it will be noticeably thicker than it should be. Another thing to check is the finish on the card as the original cards do not have a glossy finish. Also, some fakes will display a blurry image, which is relatively easy to spot. Lastly, it is incredibly obvious, but some cards are noted as reprints on the back. Although they are still popular with collectors, because of the reasons outlined above, 1984-85 Star Company cards are not universally viewed as official rookie cards for Hakeem Olajuwon, Charles Barkley, John Stockton, and Michael Jordan, who has three cards in the product. However, being licensed and pre-dating all other brands by several years, these are clearly the true rookie cards for some of the greatest NBA players of the modern era. The more widely-accepted rookie cards for most of the players that made their debut during the Star Company period came in 1986-87 Fleer. Regardless, the set marks an important addition to the hobby because it offers the earliest NBA cards for the biggest name in basketball collecting and collectors will always gravitate towards official Michael Jordan cards. 288 cards. Shop for team sets on eBay. 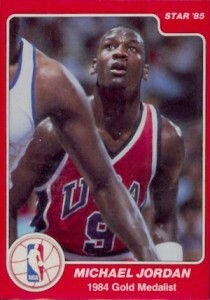 Players with their first NBA cards are noted with an asterisk(*).